In 1241 the first parish church in Świdnica was destroyed by the Tatars. In 1260, Duke of Breslau Henry III built a wooden church under the patronage of the convent of the Poor Clarcs (the Order of Saint Clare) of Wrocław. In 1296, St. Wenceslaus became the church patron and, in 1298, St. Stanislaus. In turn, in 1303, both of them became patrons. Duke Bolko II was the grandest donator to the church. Hę held the patronage over the church in the years 1358-1368. The Duke had the massive edifice of the shrine built in 1330. 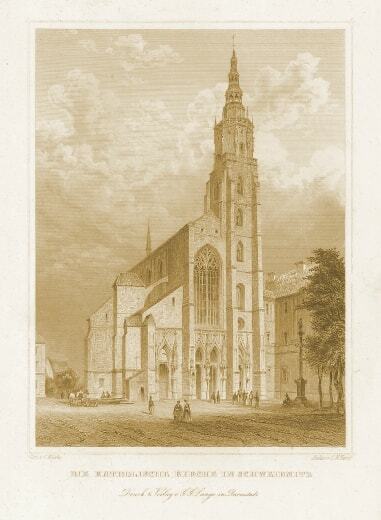 The construction works of the church were overseen by Nikolaus Lowe and the work was conducted by master Apetz (1385). Also stonemason Jakob (1377-1391) worked there – the builder of the church in Strzegom, who probably also designed the church. The aisle was founded by the family of Sachenkirch and judge Nikolaus Bolcze. In 1488, the church was given ceramic roof coating. Note signs of the masters of stonework on the stone walls of the church. The size of the church testifies to the rank of the city and the wealth of ambitious founders. The bishop Nanker personally came to Świdnica to oversee the progress of works. This is one of the grandest churches in Silesia, boasting the highest tower in Lower Silesia. The plans to build a north tower were not finalised. The present church is an oriented three-aisle-basilica, with a polygonal chancel. Under the chancel is a crypt dating from the fourteenth century, with a palm vault resting on the central pillar. From the west, four gothic portals of sandstone decorated with statues of the apostles and the patron saints of the church (St.. Wenceslaus and St. Stanislaus Bishop) lead to the church. The main portal is even. At the main portal you will find a sculp-ture of St. Anna Samotrzeć dating from year 1496. The statute of Our Lady crowns the western facade. The North Portal, also known as the Bridal Portal is lavishly decorated. The tympanum is decorated with a bust of the Madonna and Child, St. Peter and St. Paul and presumably Charles IV (?) as well as Anna of Świdnica (?). The two-sided archivolt of the portal is decorated with bas-reliefs: Aristotle and Filis and Samson and Delilah. The tower that is located on the south side was built be-tween 1420-1567. It is one of the highest in Poland, measur-ing 101,21 m. The main builder of the tower was Peter Zehin. The tower has six floors, the lower parts arę four-sided, in the upper parts it changes into the octagon. In the 2nd half of the sixteenth century, the tower was topped with a copper dome. The dome of the tower is the work of the carpenter Georg Stellauf, the author of the crowning of Wrocław town hali. In 1566, Lorenz Schneider, coppersmith from Wrocław, covered the crowning of the tower with copper sheet. In 1567, the tower was fitted with a stone balustradę in the shape of octagon, and in 1574, the balustradę was decorated with eight stone statues: St. Peter, St. Wenceslaus, St. John the Evangełist, St. Lukę the Evangelist, Jesus blessing, St. Stanislaus of Szczepanów, St. Mark the Eyangelist and St. Matthew the Apostle. In 1565 gilded grate was added to the tower crowing. Fire that struck in 1532 damaged part of the church and most of the „interior decoration and fittings. In 1660, the patronage of the church was taken over by the Jesuits who rebuilt the church, built over the large window of the nave and, in 1697, carried out the renovation works of the tower damaged during the Thirty Years’ War. At that time, the emblem of the Order „IHS” was placed on the weather-vane. In front of the church, the Jesuits placed the column of St. Florian (1684) and St. John of Nepomuk (1727). During the Silesian Wars, the church housed a camp for prisoners of war created by the Prussians, and then the flour storage in 1757-1772. On the sąuare before the church food magazine was built. In 1773, the church was restored asa place of worship. A thorough renovation of the church was carried out from 1893 to 1909. After renovation ceremony was devoted to the church in 1909. The shrine did not sustain major damage during the Sec-j ond World War. In the years 1957-1983, parish priest Diony-sius Baran carried out renovation works of the main altar and the walls. In 1979, granite floor replaced the sandstone floor of l the church. Parish priest L. Sosnowski restored the tented roof, copper coating, the painting work in the interior of the tower. Hę renovated the dial of the clock (1991-1995). In 1999, parish priest J. Bagiński carried out renovation works of the tower sec- j tion 8 at the level 54-66m. Pastor Piotr Śliwka performed successive repairs and rebuilding works of the church: of the crypt j and adjacent chambers, sacristy, parish house. Sińce 2006, maintenance works of wali polychrome have been performed. In 2006, hę renovated the stained glass windows dating from the 19th century. In 2007, conservation works of the vault and Gothic painting were carried out. Two years later, the west wali along with tracery windows were renovated. In 2011, the north wali, and in 2012, south and eastern walls. In 2004, the church received the title of cathedral. The first diocesan bishop was J.E. prof. Ignacy Dec. 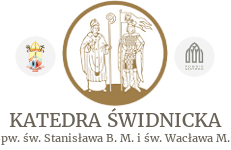 In 2017, Świdnica Cathedral was granted the title of Monument History by the President of the Republic of Poland.